Unlock your deadbolt remotely through WiFi using Netduino. The idea of smart locks has been out for a while, but at the end of the day, people still end up carrying either RFID or just use the lock itself. We pretty much carry our phone all the time now, and by the time we are at the door we are automatically connected to our own WiFi network. By using Netduino 3 WiFi, we can actually implement a true keyless experience, using our phone as the key and unlock the deadbolts through WiFi network. Netduino is a c# and.net based IoT board that has a lot of features, this way we can create the entire project based on C#. Install Visual Studio from https://visualstudio.microsoft.com/vs/mac/, In this case I am using Mac. Afterwards go to Visual Studio Community menu -> Extension -> Gallery, and search for "MicroFramework" to install Micro Framework. Because the deadbolt requires 12v and regular output of Netduino would only give 5v, We would need to tap into Netduino's power source by solder 2 wires on top like below, this would allow us to turn the deadbolt on and off without additional power source. We can now use following code to connect to the computer around. 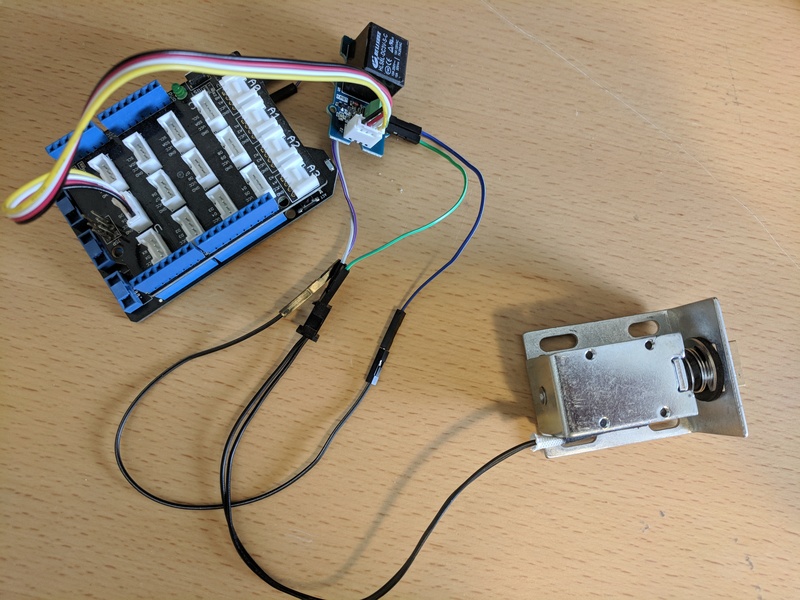 When it works we can move onto next step, we've created a NetDuino Webserver for other devices to connect via Wifi network. The following code setup the socket, and when receiving "ON" it will turn on LED as well as the relay, which allow us to open the lock. // then you have a good connection. // know if the LED is now on or off. // if we got here, should be false. // check to see if the IP address is empty (0.0.0.0). IPAddress.Any is 0.0.0.0. // if we got here, we either timed out or got an address, so let's find out. // Create a character array for hexadecimal conversion. We can build a simple Android app to communicate with the Netduino Server we've wrote earlier. Using open source Slide View. We use following code to send message directly into Netduino Webserver, and that will launch the relay to unlock the deadbolt. When that is done, we can easily slide over and unlock the bolt if we are connected to WiFi. Prototype Hacker, Intel Software Innovator, Hackathon Goer, World Traveler, Ecological balancer, integrationist, technologist, futurist.